If you read my posts and content you might know the street kred I give Gary Vaynerchuk. When I saw IHRSA 2014 included him as a Keynote Friday morning and that I’d get to have some more private interaction with him afterwards, I was stoked. In the end IHRSA 2014 was the best ever for many reasons but mostly Gary's talk which met all of my expectations. You better be a media company first because your ability to just advertise is disappearing fast. Anytime someone says “our data shows” and they are on the wrong side of history its over (referring to how Blockbuster declined to acquire Netflix for $50 Million, more on that story here ). When the Blockbuster executives explained why they didn’t want to acquire Netflix they used a variety of “facts” including that customers wanted a Blockbuster “experience”. They believed people liked running into their neighbors at the store and they wanted to purchase popcorn to take home. When I want a movie I want to lay naked in bed and hit a button. (Hearing the description “experience” must have been eery for at least a few health club industry players who use the term as their mantra). The fastest way to go out of business is to be romantic about the business you are in. Innovation does not give a crap about you or me. At least 25% of what you are doing in marketing is dumb crap (referring to marketing in the health club industry and in other industries as well). Being sorry is sometimes more powerful than the crime. Health clubs are massively vulnerable to innovation. Somewhere out there someone is working on an Uber for trainers. Its only a matter of time until it hits the market. One of the most interesting moments was in the beginning of the keynote when Gary asked who in the crowd knew him. Not many people raised their hands. Given Gary’s views and celebrity I wonder what that might imply. What Gary Vaynerchuk shared were the facts of a new world, the one we live in, and that's what made his talk most relevant. As a man who has invested in 75 startups, including Uber and Twitter, among others, he knows what he is talking about, and therefore his insights are quite relevant. There is NO doubt that the health club industry is going through the beginning of a massive revolution involving tremendous disruption, many industries are. I’ve said before that some independent club operators could be compared to independent record store owners in the 1980’s before the advent of technology completely turned the music industry on its head. Some might find that a negative outlook, but I don’t and here’s why. 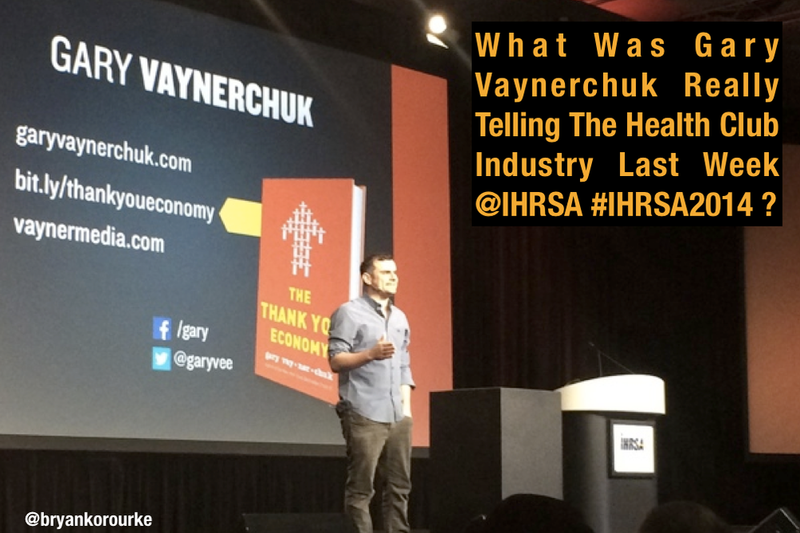 A week before IHRSA Malcolm was addressing issues in the health care arena and his quote is right, it takes an outside view to see what is happening and both he and Vaynerchuk were doing just that in their respective lectures. Gladwell went on to share historic perspectives on everything from McLean’s revolution of the shipping industry to the advent of MP3 as an operability standard for music and how that revolutionized the industry. In each case Gladwell identified that it’s the combined interoperability that has the truly disruptive and exponential effect. The underlying component technology isn’t always a new invention – or exponentially disruptive. (Read more about his speech here on Forbes ). That's why perhaps its sometimes hard to see it coming. Malcolm’s most relevant point during his speech was that despite the carnage that disruption brings, there is always a silver lining in the end. An example he used was Music stores, a dominate part of the retail landscape (and music experience) that disappeared entirely within about 5 years. By un-tethering music from a rigid distribution model around proprietary formats, music enjoyment and sales exploded. From 2000 to 2010, growth in live performances and album sales both tripled. I think Gary Vaynerchuk and Malcolm Gladwell were discussing the same views from slightly different angles. Ironically, Gladwell was highlighting how the health care industry needs to work on Interoperability standards, and the same need exists for fitness as well. And to Gary’s point, some group is working on an Uber disruptor today that will , among other innovations, revolutionize the fitness space. The risks are so tremendous to the industry now, yet few are aware of just how threatening it is and while that risk exists for most present players massive opportunities are there for the right ideas . In the end however, this will enable the health and fitness industry to expand exponentially, creating more ways to impact people’s quality of life. If Vaynerchuk and Gladwell are both sharing similar views about the present and near future for health and fitness you better prepare for what is to come. Disruption is here. Is your business preparing for it ? What did you think about Gary's speech at IHRSA 2014 ? I'd love to hear your views.